Most players who cheat use 3 methods to do so. The first one is called palming and involves the maximum amount of risk. The second and third ones are to signal and to smear. Of the three methods, palming is the most popular one and has more chances of getting noticed than the others. 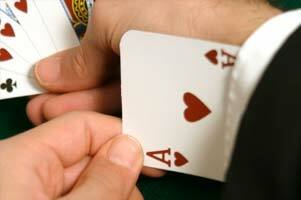 Palming involves introducing an external ace into your hand while a game is going on. This is extremely difficult to do and one has to be as good with hand tricks as a professional magician in order to manage this. The casinos take special security measures to stop cheating. Highly trained security personnel watch over the several games to notice if anyone is applying unfair means. There are cameras at all possible angles that allow the authorities to monitor all the tables in minute detail. Thus, cheating can be caught quite easily. The boxes of cards are analyzed daily to ensure that they haven't been tampered with. Casino owners are more focused on smearing. This involves using some substance on a card so that it can be identified later. Now, the smear is visible to the player and the dealer both. But, there are rumors that some cheaters use some substance to smear cards which can be seen only in a specific light. The most popular cheating process is signaling and involves at least 2 people, thus, making the risk of being detected higher. It is very tough for a normal person to know if anyone is signaling as the signals are generally highly personalized and vague. But, security officials of casinos are so experienced in dealing with cheaters that they can identify them instinctively. It is not a good idea to cheat in a big casino as the risks are very high. Most cheaters cheat in small uncontrolled gambling houses. It is not just the players who cheat in gambling; the house cheats very often too. It is obviously very easy for a dealer to cheat as he knows the cards from beforehand and can use a lot of ways to mark cards. Also, dealers generally have more space at their side of the table and this allows them to palm more comfortably. A dealer can use mirrors to check out cards that are faced downwards. Hand tricks are a big part of this as well. If a dealer becomes aware of the first and last cards he has, and, if possible, the 2nd card from top too, he has quite an edge over the players. The most common house cheating instance is when cards are shuffled after a game. Cards are collected from a position such that the high and low value cards are placed alternately. Now, these are put into the shuffling machine which pretends to shuffle while keeping the cards in the exact same position as before.